I have a theory that the charts of 1971 are the happiest hunting ground for crate-digging searchers of curiosity and diversion such as myself. Beyond Bolanmania there seems to have been no underlying pop trend that year, leaving the charts as open ground where absolutely anything could be a hit, however unorthodox, however silly, however rocking. It was in such a climate that CCS could be chart heroes. This group were essentially a lot of top session musicians under the leadership of Alexis Korner, best known as a super-credible figure on the London music scene, acclaimed as "the father of British blues" by Richards, Hendrix, Clapton, Page et al. If you are like me, you may be more aware of Korner's contribution as the guest vocalist playing the racist father on Hot Chocolate's 'Brother Louis' - "I don't want no smoke in my family. Get it? No smoke!" CCS occupied the midway point between blues scene cred and Hot Chocolate pop. Originally put together to record a top quality cash-in hit cover version of 'Whole Lotta Love', the Top Of The Pops theme, Korner then kept the name going for a couple of years to create strange pop hits that both wrongfoot and delight the listener. 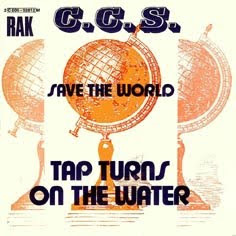 Tap Turns On The Water has a very odd structure for a hit single, the sort of thing that you would have to be both a very confident musician - and somebody with little appetite to become a pop star (Korner was already well into his forties) - to have come up with. The entire first minute of the single goes in a different direction to where the song even begins to start. We get percussion that I'd describe as boxy, in the sense that you can imagine it being slapped and thumped on packing cases, a sonorous jazz piano motif that steps forward and back, and a mariachi-styled massive fanfare of brass. This music sounds simultaneously joyous and rough-hewn, like coming across a thrilling impromptu party. See a sister in the raw? Swear you could booze all night? Sweatin' hard and you're turnin' white? Its clearly a story presented by a band of dirty men with quite a bit of scuzzy life experience... This effect is accentuated by Alexis Korner's voice, which sounds simultaneously lecherous and aristocratic. This combination is important, meaning that the singer is both someone whose been around the block, but an amusing and diverting character to listen to: a good bluesman! Tap turns on the water! - which is repeated ad infinitum. Its joyous, and the joy comes in creating a mood that is tricky to pull of, and at the root of some of the greatest pop: moronic/profound. Giraffes - Act Two, Scene One. Giraffes - Act One, Scene Seventeen. Giraffes - Act One, Scene Sixteen. Giraffes - Act One, Scene Fifteen. Giraffes - Act One, Scene Fourteen. Giraffes - Act One, Scene Thirteen. Giraffes - Act One, Scene Twelve. Giraffes - Act One, Scene Eleven. Giraffes - Act One, Scene Nine.